As the time change approaches on Sunday, March 13, the Washington State Fire Marshal’s Office reminds residents that one easy step can help save their lives – changing the batteries in their smoke alarms. 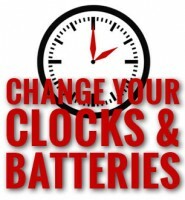 When you change your clocks, take time to change and test the batteries in your smoke alarms. “Smoke alarms most often fail because of missing, dead or disconnected batteries. Replacing your batteries and testing the alarm is a simple, effective way to protect you and your family,” says State Fire Marshal Charles M. Duffy. In 2015, thirty percent of fire deaths in Washington State occurred in homes with no smoke alarms or the alarms were not working. Ensuring smoke alarms are operational is critical to your home fire escape plan. Warnings from smoke alarms can provide those critical extra seconds people need to get out of their homes safely. Plan, discuss and practice escape routes with your household members. Being prepared and knowing what to do, in the event of a fire, can save lives. For more information about fire safety, please visit the State Fire Marshal website at www.wsp.wa.gov/fire/firemars.htm.